Box Dimensions (LxWxH) 7.0 x 4.5 x 1.3"
Multi-Card Read P8 (Black) is rated 4.7 out of 5 by 48. Rated 5 out of 5 by Nate M from Small, fast, and aesthetically pleasing I've only used the reader for SD cards so far, but it's quick to connect and be recognized, and the transfer speeds are fast. I especially like the functional design of the reader. It is possible to plug in all kinds of cards simultaneously, including micro versions without an adapter, and the thing is very small and thin, fitting perfectly in my camera bag. It has a shiny surface and comes with some protective plastic stuck to it, which is nice to keep it scratch free. The opposite side is more matte and has four little rubber feet, which seem very solid. It uses a standard mini-USB port to connect, which matches that of my camera, so I don't have to carry any extra cords. The only things I'd think could be improved would be to make it USB3, but present cards don't get too close to the USB2 data rate cap anyway. Rated 5 out of 5 by Chris from a MUST buy i had purchased an aluratek usb card reader months ago and was never too happy with it. Then a few weeks ago i was purchasing my Transcend 32gig SDHC card and this was under the recommended accessories. When i saw how much better it looked, plus all the extra ports, for HALF the price of my terrible aluratek one, i couldnt resist. now this is permanently sitting next to my macbookpro, awaiting my use. which, is always a pleasant exeperience for me. you will not regret purchasing this! great performance at a great price! go transcend! Rated 4 out of 5 by wangshiyi from nice little card reader I like this card reader although I've only used it a couple of times. It's small and portable. The only reason I'm giving it four stars is because the white USB cable. I don't get it; is this an Apple product?! Why pair a white cable with a black device? I guess I'm a little picky about aesthetics. Rated 5 out of 5 by Lawrence from Pretty Decent card reader. Use to read CF and SD cards into computers without dedicated card-readers built-in. Faster than reading from the camera, and less fussy. Obviously limited to USB2 speeds, which some built-in readers are not. What's often not obvious in the catalog is the depth (or lack therof) of slots on readers - some are very shallow, and can lead to bent pins. This one is pretty decent - and a deep slot means the pins are lined up well by the time they connect. Mostly an issue for CF cards. Included recovery software I had not even noticed (or wasn't mentioned, I don't recall) was actually able to recover a few images we figured were all lost (many others were lost, but any is better than none) when a CF card died partway through photographing an event. The fact that the cable is a Mini-USB plug-in means you can use whatever length cable you like, and the reader at least won't fail due to the cable going bad. Can't really comment on long-term reliability yet, but it appears to be of decent build quality. Rated 5 out of 5 by MightyTiki from Awesome Card Reader I did a lot of research for card readers and found a lot of issues with the latest Macbook's (summer 2010 model) using my 32GB 600X Transcend CF cards. If you have one, buy it, you won't regret it. Rated 5 out of 5 by Anonymous from Get cheap reader Perfect for reading cards. The 5d is pretty slow so this is darn fast. Although not USB 3, still does the job really well. Cable is a little long. I prefer a short cable so it is easier to manage. Rated 4 out of 5 by vhart from Quality limited The device was tested using: - a netbook (hereinafter referred to as N-7) with the system W7; - a home computer (hereinafter referred to as C-XP) with the system WXP SP3. Tests were performed with some SDHC flashcards of 8, 16 and 32 GB as well as with some microSD flashcards of 2 and 8 GB. No problem arises with N-7: the device was recognized, driver installed automatically, card got its drive letter. At C-XP, the device was NOT recognized, driver NOT installed automatically, cards were NOT mounted. After downloading and installing the driver from Transcend website (nothing was said anywhere about the need for it) the device began to work fast enough (tested as USB device). The strange fact is that it occupies TWO disc letters when the card is inserted, the first of them corresponds to no data carrier. Rated 5 out of 5 by Dee from Awesome! Very usefull! Great on the go, very small but durable. Awesome buy at a reasonable price. I have this product but lost the installation disk. Is there a free download for this? Yes, you will be able to download the software that's included with the disc for free. To do this, please visit Transcend's webpage and this will all be under their support section. Is this both Mac &amp; Windows compatible? does it connect using USB? 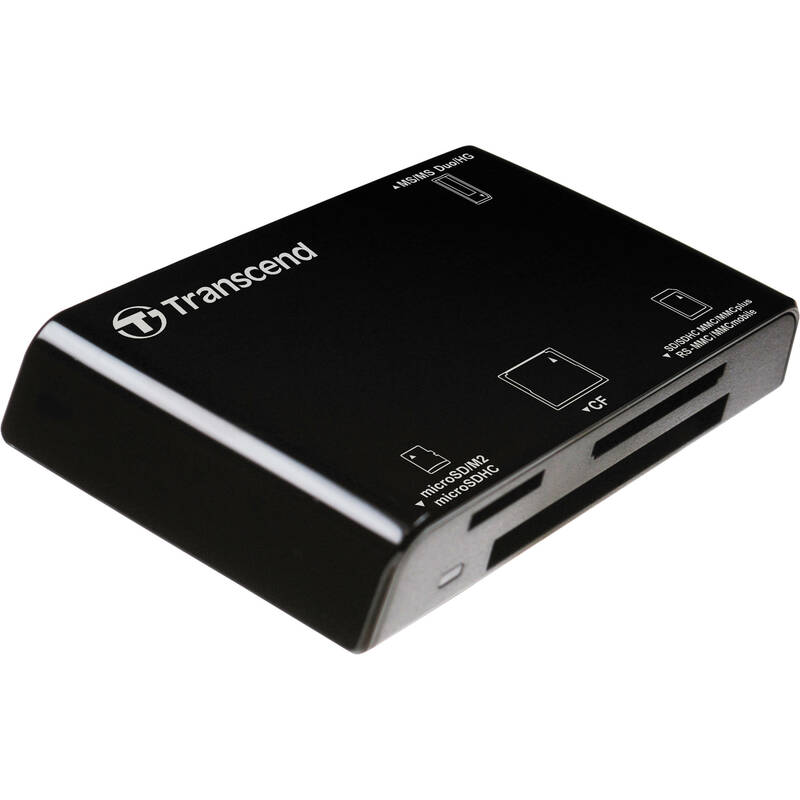 The Transcend Multi-Card Read P8 is compatible with Mac, Windows and Linux platforms, and connects via USB 2.0. Does it come with a USB cord? yes, the computer end has USB @ connector on it. Yes it does. It is a very good card reader and I have never regretted buying it.